The Naviop company came into being as a department of the multinational Exor. It was set up in 1999 for the development of navigation technologies. Exor is a world leader in the field of automation systems production and wanted to exploit its precious know-how by getting into the production of naval systems. Since its establishment Naviop has been growing unexpectedly. Its systems are authorised by the Italian Shipping Register in accordance with AUT-UMS standards and are installed on numerous ferries for the transport of passengers and vehicles. In 2002 the company experienced a very important period: with considerable investments in technology and human resources it took on its present day form in which it is involved in the development and spreading of integrated systems that are much appreciated in both shipping and pleasure yachting contexts. Naviop works side by side with a company which for more than 25 years has been manufacturing control switchboards and electrical systems for vessels, a partnership that has resulted in a dynamic staff capable of responding to every kind of requirement. What this Romagna company offers includes hardware and software solutions for management and control of all on-board systems, from propulsion and safety to relaxation. 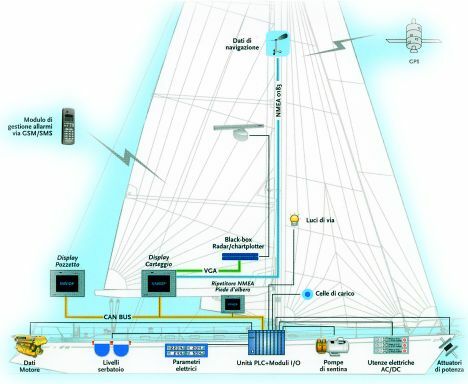 Reading the foregoing you might think we are talking about domotics applied to yachting, but Naviop systems are much more and domotics is only a part of the services it offers. Imagine a central system that receives data from all the on-board sensors and systems, from those in the engine room for checking working status and engine efficiency to video cameras, intrusion sensors, fuel and water tank level sensors, radar, GPS, wind station, depth-finder, electrical switchboard, bilge pump alarms, air conditioning etc.. Well, all these data arrive at a central unit where, by means of touchscreen technology monitors, they are not only visible but can be controlled: this means that if we want to switch on the air conditioning for example we can do it from a monitor, just as we can modify the lighting conditions in each environment or carry out navigation by integrating the system with the plotter. 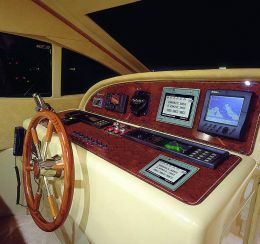 Of course there is only one central unit, but monitors may be installed anywhere on board: in the skipper's cabin, the owner's cabin, in the saloon, on the flying bridge and on the main bridge. Each video terminal not only supplies all information transmitted by the on-board sensors but also permits management of each individual system. What seems most important however is that from each terminal you can be advised, by sound signals and graphics, of any system malfunctions or of excess liquid in the bilges or smoke in the engine room or any other unsupervised area. These features mean safety and accident prevention, also because the software adapted to each individual application permits evaluation of whether the malfunctioning of an apparatus may have been triggered by a series of data picked up by the sensors. The flexibility of Naviop systems results from the flexibility of company staff who daily study new solutions for the integration and management of all the sensitive parts of a ship or boat, be it powered by sail or engine. The software can be integrated with numerous functions: for example, in the management and monitoring of propulsion or generator engines you can programme the maintenance tables which will then be displayed beforehand on the LCD monitors distributed on board. Another important safety element in Naviop systems is the recording in a special file of all anomalous events, like the black box aboard an aircraft. This permits a posteriori analysis of what caused a breakdown, with view to finding solutions that will prevent recurrence of the same anomalous behaviour of electrical or mechanical apparatus. Of course for safety reasons certain functions, though available on each monitor, may only be handled through insertion of a password, thus sidestepping the risk of an inquisitive guest causing damage by investigating the multiple functions of the monitor he finds in his cabin. As for management and monitoring of sewage, dirty water and drinking water levels, the user has a precise, real-time, clear and reliable reading of these values, obtained from precision sensors installed and calibrated in each tank and linked to an independent system module. In this case too, naturally, the required minimum and maximum levels may be programmed for each tank. Notwithstanding its multiple functions, use of the system is simple and intuitive. In fact even without reading the manual you could go by intuition on the basis of the clear and precise information displayed on the monitor for management and control of each on-board system. All this has been made possible by the development of easily identifiable graphics, integrated with online help that is easy to consult. Substantially, each individual system or instrument is shown graphically on the Naviop monitor, leaving no room for doubts about interpretation. This is, indubitably, a complete and complex system, but thanks to integration and miniaturisation it is simple to install and adapt aboard any kind of vessel, be it under construction or undergoing maintenance. Another interesting detail is that the Naviop system monitors can receive all types of video signals, either from a video-camera or decoder. For further information contact: Naviop, Via E. Benini 4, z.a. Vecchiazzano; 47100 Forlì (FC); Italy; tel. +39 0543 482161; fax +39 0543 483661; e-mail info@naviop.com; website: www.naviop.com.